The Income v Expense report may be most loved by accountants, but it's packed with decision-making power for everyone. It gives you both an overview and a detailed view of the income and spending in your Budget accounts. Budget accounts, you say? Tracking account activity won't be reflected—with the exception of transfers between a Budget and a Tracking account (which require a category). They track account balances, so you'll find them in the Net Worth report. Income is every transaction categorized as Inflow: To be Budgeted, which you'll see broken down by payee. Although rare, it's possible to have negative income, which is typically a balance adjustment made while reconciling an account. Any inflows with a different category (for example: a refund categorized as Clothing), will be in the Expenses section, which is up next. You can click any amount to get a full list of transactions, and each transaction is a shortcut to the account register for quick and easy editing. Expenses are shown by category group, which can be expanded to show individual categories. The real key here is in the average column. No matter what you wish your spending habits were, averages don’t lie. Your true spending helps you get a sense of your True Expenses so you can set realistic goals for the future. Collapsing the income and expense sections will give you a bird’s eye view of whether or not you’re bringing in more than you’re spending. 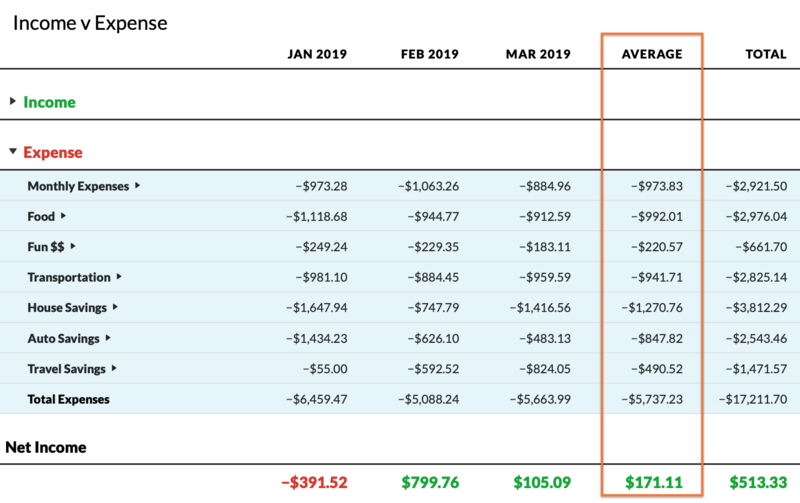 You might expect your Net Income to match the change in Net Worth for that month, but remember, the Income v Expense report does not include Tracking account activity. Starting Balances are also omitted (unless the payee or category is changed), because in the accounting world, they are considered equity rather than income. Payments to your credit card accounts are not listed as expenses either—because individual credit card spending transactions are already included. Starting Balances and debt payments are reflected in your Net Worth report, so head over there next!